Creative’s invention for the user interface for portable media players enables selection of at least one track in a portable media player as a user sequentially navigates through a hierarchy using three or more successive screens on the display of the player. One example would be the sequence of screens that could display artists, then albums, and then tracks. When the user selects an artist, the player displays a list of albums for that artist. Selection of one of the listed albums then displays a list of tracks on the album. “The user interface covered by the Zen Patent was invented by Creative research and development engineers in our Advanced Technology Center in Scotts Valley, California,” said Sim Wong Hoo, chairman and CEO of Creative. Talk about patenting the obvious. Hmm, let’s see…select artist, then album, then track…genius! I wonder what the “major investment” consisted of? 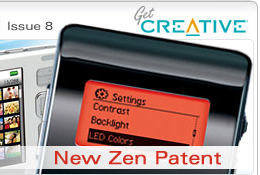 It would be nice if Creative would instead create firmware updates for their existing products like the Zen Touch to support Windows Media subscription services and fix their playback problems. And of course, there are plenty of mentions of the iPod and how this Creative patent covers work that predates the successful audio players from Apple. Anyone smell a lawsuit coming? For the past couple of months, I’ve been getting good use out of my Creative Zen Touch 20GB MP3 player. I’ve copied over about 20 of my CDs but use it mostly for podcasts during my commute. Overall I’m quite happy with the device, but have noticed a problem with certain podcast files which would play back at the wrong speed — usually 1/2 or 1/4 speed. “Download the latest device firmware” (which, coincidentally, had been released that same day). This didn’t fix the problem, but at least I have the latest software now. “MP3 was probably ripped from a copyrighted CD”. Huh? This one makes no sense, and in this case it was a downloaded MP3. “Our player can only support bitrate of 40kbps and above”. Aha! That’s the missing piece. I closed with Creative by requesting that they forward this issue to the development team for future consideration. Perhaps someday this will be fixed. I can see how the problem would happen from the development side; they’re aren’t too many audio MP3s at such a low sample rate, but for podcasters trying to minimize download times, these low rates are essential. Creative: Since other MP3 files play properly in the player, then the problem could be with the audio file. Me: Since other MP3 players play this audio file correctly, the problem could be with the Zen Touch. Update 2006-01-17: I just discovered that Creative finally released a firmware upgrade to support the PlaysForSure format (Yahoo! Music, Rhapsody, etc.). This firmware update may also help these playback problems, but I haven’t tried it yet: [http://us.creative.com/support/downloads/][http://us.creative.com/support/downloads/]. Portable USB drives (loaded with flash memory from 64MB, 256MB, and up) have become quite popular and are really handy for carrying files or data around with you. I've started carrying around a 64MB drive from Jungsoft, keeping with me several files that I'm working on. It saves the trouble of emailing files to myself or burning CDs. What would really be useful is a way to “synchronize” the files quickly with whichever PC I'm working with. I'd like to be able to plug the drive in, sync, do my work, then sync again when I'm done. The tool should automatically copy the latest of each file in the right direction. I looked at using Windows' Offline Folder Synchronization feature, but it appears to only work for true network drives. I also looked at Briefcase, but I've had trouble making that work in the past and it seems flaky. Unison has an added benefit of working on Unix/Linux as well as Windows, so it can be a cross-platform solution. They have some support for Mac OS X, but it doesn't yet handle resource forks so it's probably not viable for Mac users. Now I just plug in my USB drive, run the Sync.bat file to synchronize, and I'm all set. Being a command-line tool, it's a little rough around the edges. A nice, simple GUI application would be a good improvement. Also, this solution won't sync files that have been modified on both sides; these need to be resolved manually. Previously I wrote about rebuilding my home server. With the server's failed hard drive crisis under control, it was time to update the main family PC which has been showing its age and whose hard drive was starting to fail. Step Two: A new 3GHz PC from a local computer shop. Murphy’s Law was in full bloom recently when our home PC’s hard drive started to fail and my server’s drive just locked up cold one day. Thus began the great computer fix-up of 2003 for the Cantoni household. Step One: New hard drive storage for the server.